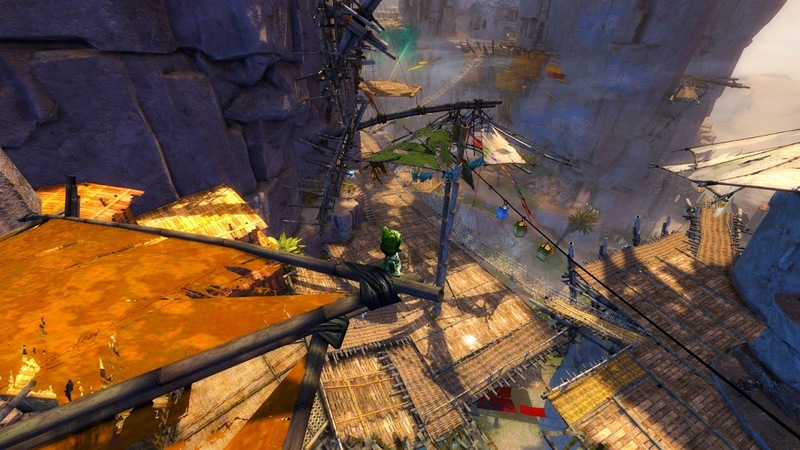 Over the years, one of the regular criticisms I've heard about GW2 is how the very concept of "Map Completion" undermines any genuine sense of exploration. How can it be a game for true explorers, the argument goes, if every Point of Interest is marked on the map - literally? The truth, of course, is that map completion isn't for Explorers at all - it's for Achievers. Those people who love ticking things off a list and getting a badge at the end to say they ticked them all. If Explorers complete maps it's by default. Sheer nosiness leads them into every last crevice, cave and corner and if those little boxes tick themselves along the way. well that's how serendipity works. I came across an excellent example of this yesterday in Crystal Oasis. I hadn't set out to explore anything. I was actually looking for one of the new ranger pets. For Path of Fire I've been trying to look up as little as possible out of game and although I've had my eyes open for them since day one, so far I have only spotted one of the Juveniles, the Jacaranda. Then one day, while I was following the storyline on my Elementalist (something else I hadn't planned on doing but which just somehow happened while I was meaning to do something else) I caught sight of the Juvenile Sand Lion as I was running past. I made a mental note of where it was and a couple of days later, when I next logged my druid in, I took him over to get it. An hour or so later, as I found myself flapping along on my griffin, I spotted something below me that looked hauntingly familiar. Swooping down, I landed on a rope and bamboo bridge that looked for all the world like something out of The Bazaar of the Four Winds, the long-lost, much-missed home of the Zephyrites. At this point I got all excited. 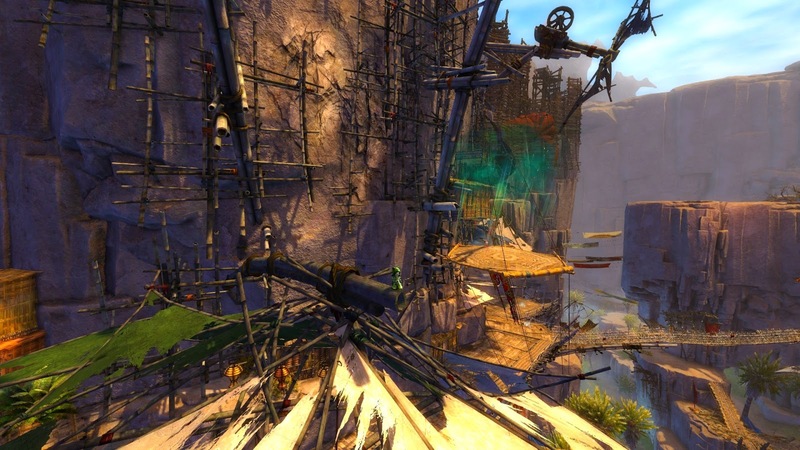 Was this where the remnants of the Zephyrite airship fleet ended up after the debacle in Dry Top? It's always been clear that not all the ships came down there but we've had no news of where they might have gone. First I climbed to the very, very top of the bamboo structures, poking into every nook, using my griffin, my glider and my bunny to get as high as I could. I saw paper lanterns and familiar platforms. This had to be Zephyrite work. Nothing I found explained how it might have come to be there so I descended again to see if there were clues at ground level. Which is where I discovered not only clues, but NPCs talking about the mysterious people who'd built these structures and how they'd left en masse in a flotilla of airships, never to be seen again. I also learned how the abandoned town had become a home for refugees fleeing the conflict in the South. And finally, right at the bottom, beside the road, I found a Heart, one of the pieces of busy-work that GW2 uses as a quest substitute. Also one of the things required for Map Completion, marked on the map, pointed to by NPC Scouts and pinged to your attention by the UI whenever you get close. What's more, I'd been in the town before: several times. With my both druid and my elementalist. What I had never done during any of those visits was what Telwyn so astutely recommends we should all do when we come to a place we've never been before: look up. Thus it was that I came to discover the original home of the Zephyrites, before they took the winds in their unfeasible wooden craft. It was an evening of discovery, excitement and above all exploration. Yes, I left with a box ticked but the session was anything but a box-ticking exercise. That's how GW2 works best for explorers: if you come at it sideways. Or from above. Or below. Any damn way but by following the map. And then I went and got my pet! Three more to find (I think). Might have them by Wintersday at this rate. Did you climb up to the very tippy top where they actually having the airship docks scaffolds, now overtaken by Branded crystals? If not, there's still more to explore! It's exactly why I love PoF. A lot of the Achievers have gone one swift round hitting all the signposts and concluded there's nothing more to do. I went poking around the non-signposted parts of the very first map Crystal Oasis the other day, after having completed map exploration of all five maps... and found a puzzle with torches that concludes with a big ol' chest, and a "jumping" puzzle involving jackal sandportals that can be bypassed with other mounts if you hate sandportals which ends with THREE massive glorious chests. They've become my new daily must-hit. Ah! I got to that part, yes, with the branded crystals and the plateau, but I didn't realize the machinery was the airship dock. At that point I didn't know I was at the Zephyrites' original base - I was working on the hypothesis that I'd found where some of the scattered fleet had landed, not where the whole thing originally began.